•Spoke Art: April 7, 2016. "The 5th Annual Moleskine Show." San Francisco, CA. •Bakersfield Museum of Art: April 9th, 2016. "Kern County Plein Air." Bakersfield, CA. •Christopher Queen Gallery: May 1st, 2016. "The Golden Hour." Duncans Mills, CA. •Abend Gallery: May 13th, 2016. "Contemporary Figuration." Denver, CO.
•Paso Arts Fest: May 26th, 2016. "Signature Exhibition." Paso Robles, CA. •Los Gatos: June 18th, 2016. "Los Gatos Plein Air." Los Gatos, CA. 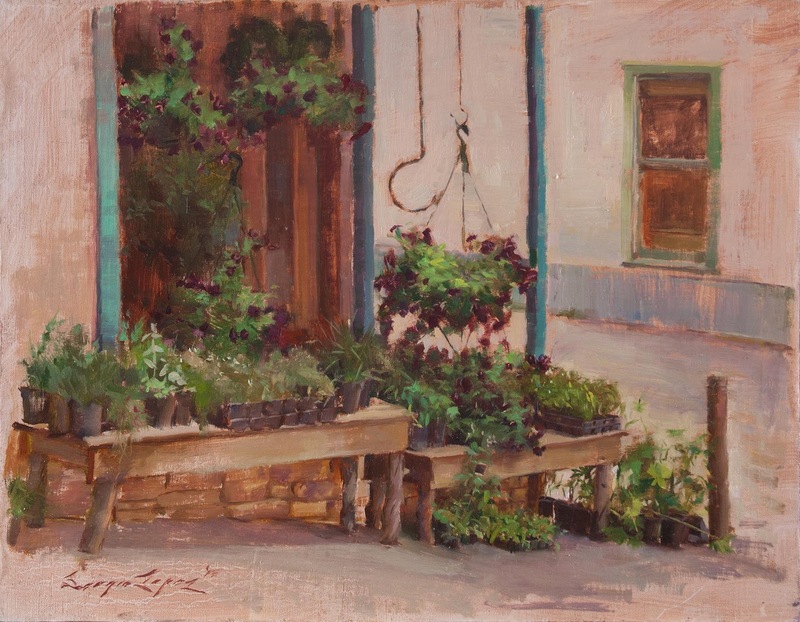 •Sonoma Plein Air: September 10th, 2016 "Sonoma Plein Air." Sonoma, CA. •Modern Eden Gallery: September 17th, 2016. Beautiful Bizzare Invitational Show. San Francisco, CA. •Christopher Queen Gallery: October 2nd, 2016. "A Splendid Journey: 40th Anniversary Show." Duncans Mills, CA. Find Me On Your Favorite Network! We paint every last Sunday of the month. Today was the day of the infamous "Quick Draw." The morning was spent framing everything so I didn't have to worry about it in the evening. There's nothing like being free of responsibility for at least a little while when it comes to these events, if even for a short while. We had 1.5 hours to execute our quick-draw for the event. I actually shaved off even more time for this one because after I set up in the desired spot, I realized I had the wrong sized panel in my box for my frame! So I had to race back to my car, grab an 8x10" panel and run back to my set-up, losing about 20 minutes in the process. So technically I executed this one in a little more than an hour. Pretty successful of a painting of this complexity for the time spent. I packed up as quick as I could to run back to the park where we were supposed to set up our painting for display and sale. "Coffee Cowboy" 8x10 oil on linen mounted on board. Sold. Congratulations to Erich Neubert who won the best quick-draw award. His was a sweet little painting of alleyway near the Opera House. Ok. NOW the responsibilities were over. The event of the evening was the Artist Choice Award Gala and Sale. Another success for me! Not only did I win Second Place for Artist Choice(and a half-page ad in Southwest Art Magazine to go with that ribbon) but a sale too! Although it retailed for $550, the bidders drove it up to $900! Quite a shot to the arm wouldn't you say?? After this, we went to Brown Dog Pizza to celebrate. I hung around and talked to Josh Been about art and business. Very interesting person to talk to about these things! Not only is he a really good painter, but he has some very unique, dare I say revolutionary ideas on how to market and sell work successfully as an independent landscape painter. He's doing very very well and I hope someday he writes about what he knows, because I think he may have the potential to help a lot of artists with what he knows. The first day of the sale was a good test to see whether or not my strategy of painting a lot of small "affordable" works to show as many as possible. I would say it worked out well for me. After doing so many events where so few paintings sold, it was nice to see some come off the walls. On this day I sold "Coffee Cowboy," "Swift Silhouettes," and "Poppy-Art." The next day was the 4th of July holiday, which brought many more people to downtown and the event with it. This meant many more sales to make up for yesterday's thinner sales for the other artists. I sold "Lyrical Liquid" and "The Final Capture" early in the morning, but I think I was too engrossed in the painting I did to try and sell a whole lot to the passer-by's. This painting took me all day to do, but I was happy enough with the results. "Purple Petunias" 14x18 in. oil on linen mounted on board. $1500 Inquire here. The show was now over and the artists were reasonably happy with the event and the sales. We said many goodbyes and got a little group together to go to Jill Carver's place in Rico, which is about a half hour away. I just met her the day before, but she was super-nice to me and so I was excited to head over to her home and have a final pow-wow with other artists. She has some killer views being nestled in the Rockies, and her walls are very impressive! Not only did she have a good collection, but she had some of her great paintings up for display as well. It was so cool! I was so glad to spend the evening with her. The view from Jill Carver's house. Rather than re-trace my trip back through Salt Lake City and northern Nevada, I went south instead through northern Arizona. This meant that I could see parts of some areas that I had really wanted to see for a while. 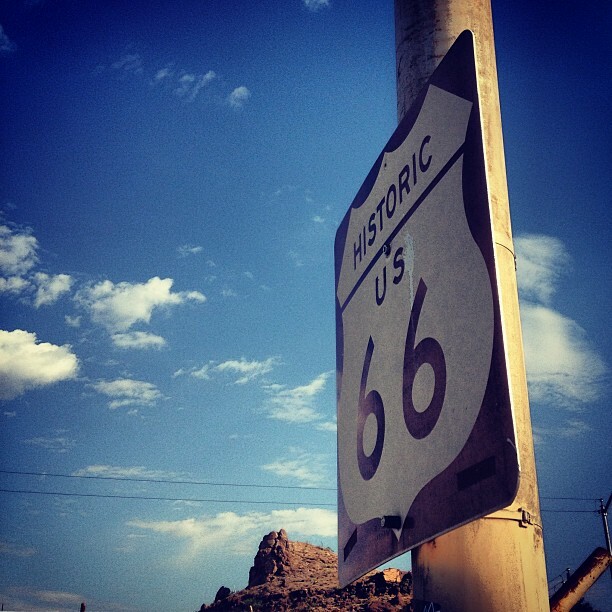 On the outskirts of Monument Valley. I got a chance to see the Grand Canyon for the first time! This was a very worthy detour, as you would expect it to be. It was weird, just as soon as I got near the canyon, it got very stormy with major rolling downpours passing through the area. It made for some very dramatic eye-candy. Best believe I took plenty of photos! Such a beautiful area, and fun to paint for someone who loves depicting atmospheric distance as much as I do! I met Bill Cramer in the Telluride event, and his Grand Canyon paintings are among some of my favorites. So his were fresh in my mind as I did my humble study. It would be a dream to come back and spend a week painting here. As luck would have it, there is a plein air event in the area. I will have to apply next year once I create some paintings of the Grand Canyon to put in my portfolio. I got tired of getting sometimes-rained-on at the Grand Canyon so I went down to Flagstaff to check it out. I was pleasantly suprised at how much I enjoyed the area. 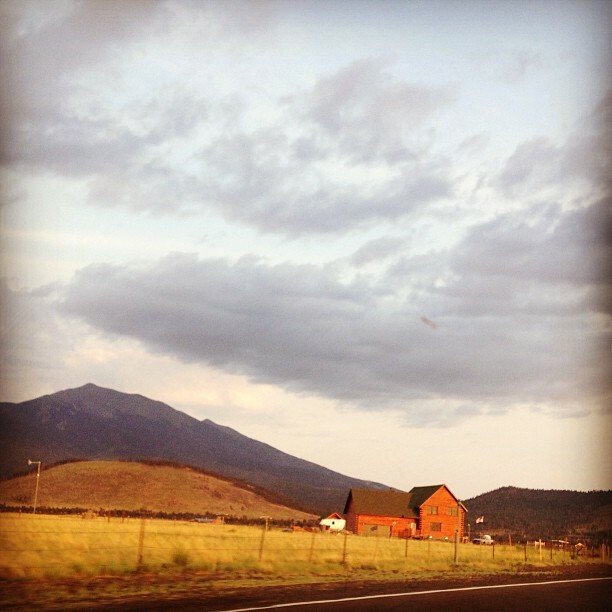 I was not expecting an alpine community with mountains, ponderosa pines and aspen trees. 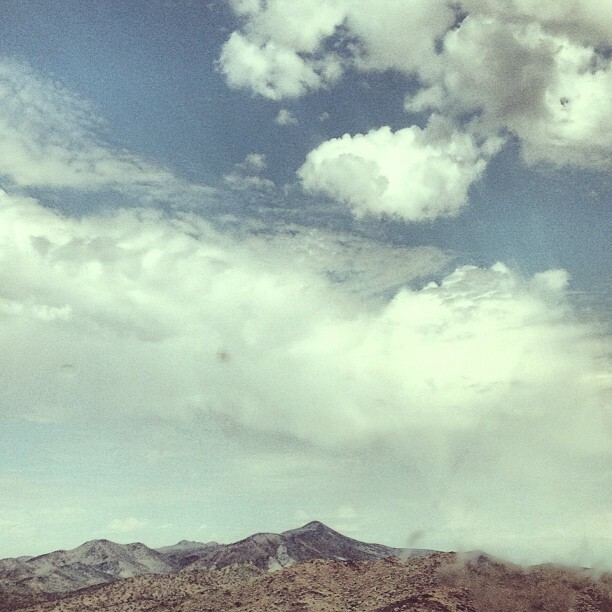 Totally not what you think when you consider Arizona. I really ought to come back and paint in this area. Very picturesque and possibly underrated due to its proximity to the Grand Canyon and Sedona. A thorough exploration of Arizona is definitely on the list of things to do in the future. Mt. 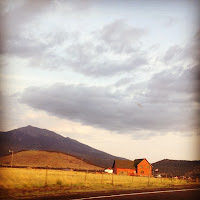 Elden and a farm in a pretty meadow near Flagstaff. 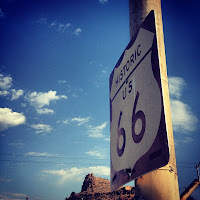 I stayed in Kingman along Route 66. The nostalgia of that number is the only thing they had going for themselves. Once I made it back to California there wasn't a whole else to excite me. Apologies to the fans of Barstow, Bakersfield, Fresno, and Modesto. I loved my trip to Telluride. There was much to see along the way, there were a lot of good artists, the organizers were good, sales were good, and the location is beautiful. Does it live up to its reputation? I believe it does, although I do believe that as far as careers go, it's more of a destination than a launch pad to greater things. It's too early to say whether or not it will be a boost to my career, but the ad prize can be to my advantage if used smartly. Being an award winner I believe I will be asked to come back and I definitely would. I would urge serious plein air painters to keep applying to this event because I believe it does live up to its reputation as one of the top plein air events. What kind of frames do you like to put on paintings you own?